To see some useful jobs computers do, scroll down and try the activities. How do we use algorithms every day? What is a robot and how do robots work? Can you program a robotic arm? Drag icons in "Actions" and drop them in the correct box in "Steps". Click "Online Flash" to try the game on a desktop or laptop, but please note, Flash may not work on all browsers. Please ask a grown-up before clicking on the links for the iOS or Android apps. Just what goes on behind the screen, beneath the keyboard and inside the electronic ‘brain’ of a computer? This colourful book has 70 flaps to lift to uncover what happens when a computer is switched on, how coding works and the story of the first computers. A fun and informative introduction to a key UK curriculum topic. 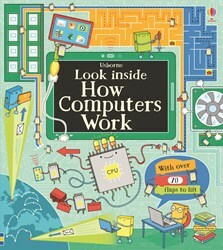 This book will help anyone understand how computers work... The information is presented clearly and in such a fun and interactive way that children will hardly notice how much they’re learning. This is a colourful and detailed introduction to an increasingly hot topic in the world today... not only a fab book for young budding tech fans, it'll also come in very handy with any ICT homework. The book is packed full of educational information to engage your child, from the history of computers through to how computers work and basic coding... a brilliantly written and presented educational resource, with endless facts to stimulate older as well as younger minds. Colourful, fun and very informative.